Below are the Top 5 items from March 2018. Last weekend, the State Legislature approved the 2018-19 State Budget. This year’s negotiations were particularly challenging as a multi-billion dollar budget gap was looming, but the Assembly, Senate, and Governor were able to come to an agreement and pass an on-time budget. The State’s fiscal plan once again capped spending at 2% and avoided a number of new fees and taxes, such as the proposed tax on purchases from internet marketplaces like Amazon. As Chair of the Assembly Committee on Aging, I was glad we were able to secure funding for important programs and services for seniors across the state. The budget also includes increased funding for our local schools, as well as a boost in afterschool funding – an issue that I focused on during my time as Chair of the Children and Families Committee and Chair of the Legislative Women’s Caucus. We were also able to secure language that prevents convicted domestic abusers from accessing firearms. However, there were a number of important issues that were not taken up within the budget, such as passing the Child Victims Act, allowing for early voting, and closing the LLC loophole for campaign contributions. I’m hopeful that we can act on these measures as individual pieces of legislation before the session wraps up in June. On March 23rd, I joined the Chamber of Commerce and local women community leaders to announce details of a new group that we formed called Broome Women Lead (BWL). 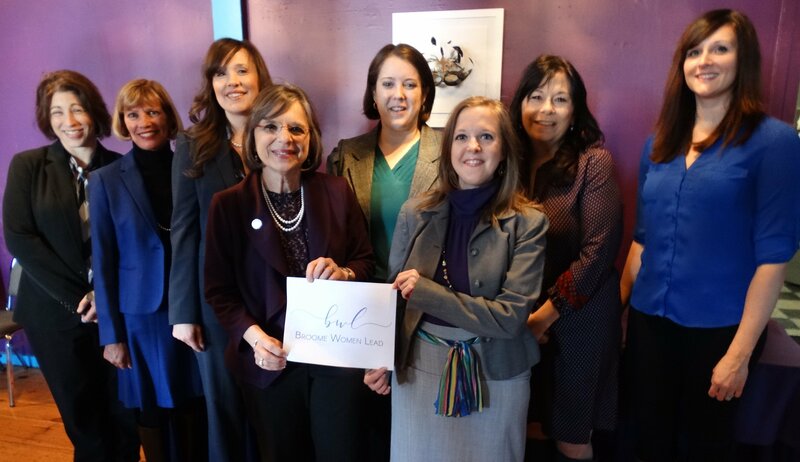 Our mission is to educate, support, and advance women leaders in Broome County in order to promote economic, community and personal development. Broome Women Lead will provide the tools, mentors, and network to assist women with effective leadership in their profession and community, while inspiring and guiding future leaders. By meeting and mentoring one another we will also be building a stronger and more resilient community in the process. You can a request to join our Facebook group here. A kickoff luncheon has been scheduled for April 19th at Cornell Cooperative Extension, but incredibly, we have already reached our limit of 225 tickets sold. The group will meet every other month and rotate between breakfast, lunch, and after-hours events. Broome Women Lead launched on March 23rd with an announcement of its inaugural luncheon event. In February, County Executive Jason Garnar and I sent a letter to Tom Rutledge, CEO of Charter Communications (the parent company of Spectrum Cable) to ask that negotiations with Northwest Broadcasting (the parent company of local stations FOX40 and My8) resume. As you know, local cable subscribers have been without these stations for more than two months, and we also asked that discounts or refunds be given to customers who are currently paying for service they are not receiving. We received a response from Charter’s VP of State Government Affairs on March 15th. In this response, Charter says that the information being provided by Northwest and its affiliates is inaccurate and that the dispute stems from “exorbitant fee increases” they’re requesting. The letter does not address our concern that subscribers are being charged for these channels during this blackout. This continued dispute has added to customers’ overall dissatisfaction with cable services and fees. We are now looking at what else we can do to help restore service. March is Women’s History Month and NYS is committed to honoring the legacy of women who made important contributions to our state. Following the success of our efforts to celebrate the 100th anniversary of women’s suffrage last year, the Governor’s office was interested in featuring the Ladies of Lisle at the Women’s History Month exhibit at the State Capitol. 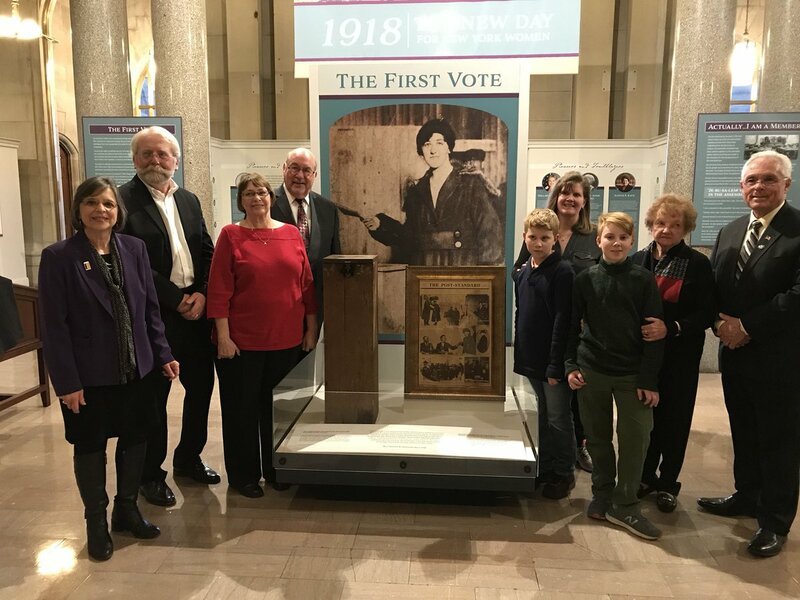 This display features the original ballot box used by Florence Chauncey, the Lisle resident that became the first woman to vote in NYS on January 5, 1918, the historical marker we dedicated in honor of the Ladies of Lisle, and an original newspaper that detailed the historic vote. On March 5th, I joined the Lieutenant Governor in welcoming Chauncey’s family, as well as Joan Deinhardt, the owner of the original newspaper, and her family as the exhibit was officially opened. The display was originally scheduled to be up through March, but it has been so well-received that the Governor’s Office has decided to keep it open through mid-May. I am very proud to know that these unsung heroes of the women’s rights movement are now getting the recognition they deserve. (l to r) Assemblywoman Lupardo, Preservation Association of the Southern Tier Director Roger Luther, Florence Chauncey granchildren Jan and Jim Vollertsen, Joan Deinhardt and her family, and Assemblyman Cliff Crouch at the opening of the Women’s History Month exhibit at the State Capitol. Getting students interested in STEAM (science, technology, engineering, arts, and math) subjects has been a focus of mine throughout my time in office. Jobs in these fields are growing and will offer future professionals great opportunities. 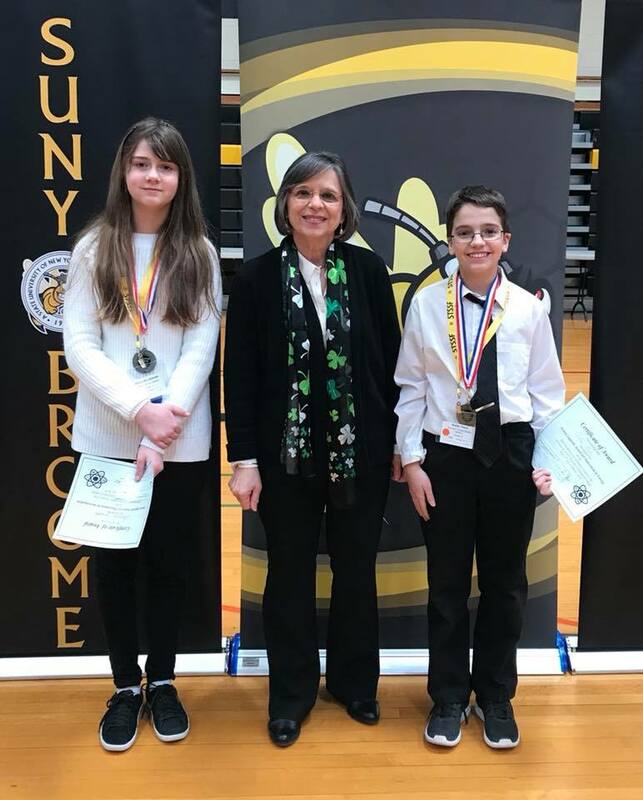 On March 17th, I attended the Southern Tier Scholastic Science Fair at SUNY Broome and saw firsthand that we will have no shortage of bright young minds to fill these jobs. Each year I sponsor an award at the science fair and I was pleased to present the “Innovations in Energy” award to Alexandra Zalesski and Austin Kane for their terrific projects. Congratulations to all the students who participated. This also complements the exciting work being done at Jennie F. Snapp Middle School, where I got to see a wonderful program called SciGirls, sponsored by WSKG. 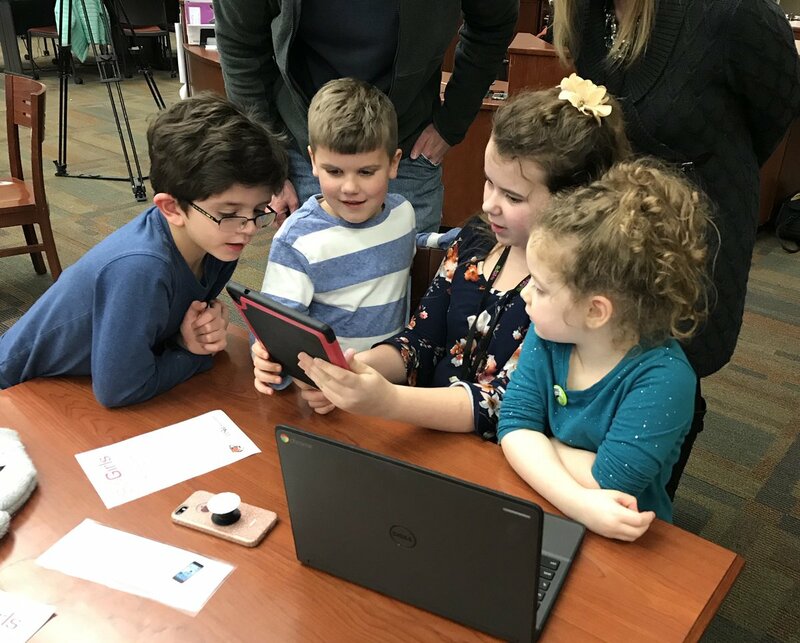 Assemblywoman Lupardo with winners at the Southern Tier Scholastic Science Fair (top) and a young app developer shows off her work to her classmates as part of the SciGirls event at Jennie F. Snapp.